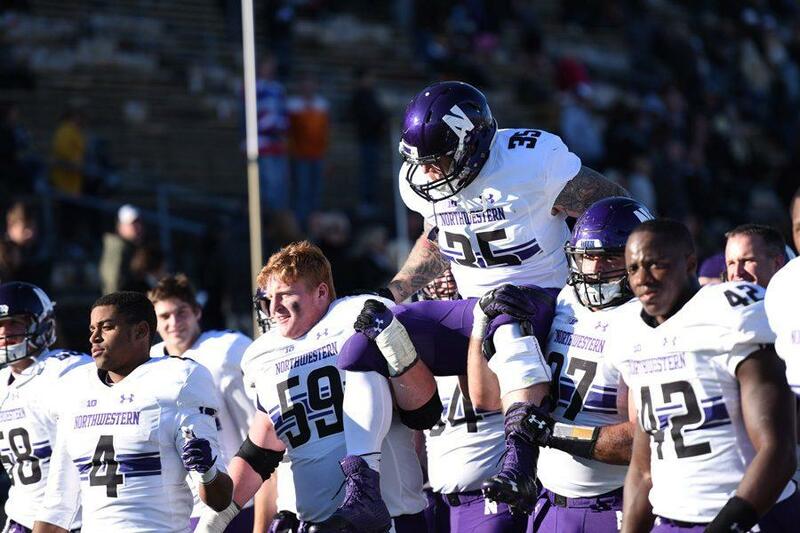 Northwestern players lift a teammate on their shoulders in 2016. The National Labor Relations Board’s general counsel said in a memo that college football players at private universities can seek certain employee benefits. The National Labor Relations Board general counsel made public Tuesday an advice memorandum expressing his position that college football players at private universities can legally seek compensation and improved working conditions. The memorandum referenced the case in which some members of Northwestern’s football team moved to unionize in January 2014. A regional board sided with the players in March of that year, but the NLRB rejected the petition altogether in August 2015, declining to rule on the case and effectively declaring that student-athletes should not be considered employees. Citing evidence that college football programs and the NCAA regulate “players’ hourly tasks from the time they wake up until the appointed hour that they go to sleep,” the counsel stated that scholarship football players possess employment rights protected under the law. The lawyer’s position would not solely apply to Northwestern, but also to other private institutions like Stanford and Notre Dame. Additionally, the counsel noted that the employment status of student-athletes in other sports cannot be determined due to the lack of “a full Regional investigation” like the one that took place at Northwestern. The memo does not issue a declaratory legal ruling about the state of student-athlete employment nor does it affect the NLRB’s August 2015 dismissal of a petition by NU football players seeking recognition as University employees and gaining the right to collectively bargain. Rather, the memo merely states the position of the NLRB general counsel and his position on related cases going forward. It is similar to an earlier memorandum that was made public last October, which referred to NU football players as employees, but Tuesday’s document took the extra step of expanding the counsel’s position to all private universities. Although the general counsel, an appointee of former President Barack Obama, appears to favor recognizing student-athletes as employees, his term ends in November. President Donald Trump will appoint the next counsel and the five-member NLRB will change to a Republican majority, which will likely be tougher on organized labor.